Infrastructure as a Service is the most commonly used Cloud service by small businesses looking to flatten their IT budget in to a consistent monthly expense. Run your software from the Cloud. MontanaSky offers hosted office automation tools that simplify accounting, add scalability to managing staff changes, availability for remote employees, and the reliability of redundancy. Take advantage of MontanaSky's advanced routing and security. Networking has evolved. It’s now common for a company to run two or three internal networks, segregating data to ensure security. Networking has evolved. It’s now common for a company to run two or three internal networks, segregating data to ensure security. MontanaSky works with small companies to understand their specific networking needs offering hosted enterprise level equipment and expertise to install remote firewalls, Quality of Service, and routing. Companies attempting to connect several locations into one network find MontanaSky’s NaaS particularly useful. MontanaSky View is a unique hosted monitoring tool capable of monitoring several IT assets with up to 20 different monitors per device all through a single portal. MontanaSky has the ability to provide multiple levels of monitoring of Internet connected devices. A MontanaSky administrator can configure alert thresholds, setup messaging priorities, and get a quick visual of the status of all your monitored devices. MontanaSky View can monitor things like temperatures, equipment failures, and capacity issues as well as plain connectivity status. Couple MontanaSky'z monitoring service with an IT Service contract, and a technician may have your issue addressed before you even know it happened. MontanaSky View is $15/month per device. Would you recover from a Data Loss? The majority of small businesses back up their data regularly, but only a few back up off-site, and even fewer know if their backup will work. Ask us about our uberVault on-site and off-site backup service. Starting at $100 / month if bundled with other services. Setup fee may be waived with contract. Here is where the uberVault is truly unique. You may have heard of online remote backup solutions before. But uberVault is different in that it provides a full local and remote backup with history. Each day is automatically saved in a folder and named according to the current date. The off-site backup are generally scheduled to take place at night when your Internet connection is not being used for other things. Give your Business Server or Web Server a new home! When you host your Business Server or Web Server with us, you will take advantage of 24/7 Monitoring, Air Conditioning, Power Backup, Connectivity Redundancy. If you are looking for a home for your business server or web server, we have one waiting for you. Select what level of involvement you want from our administrators. Bring your server to us and we will plug it into our infrastructure. Take advantage of our massive bandwidth, power redundancy, fire protection and 24/7 monitoring. You may hire us to build and/or manage your co-located server. You decide what level of involvement you want from us. A Virtual Server has all the advantages of a dedicated server and the cost savings of a shared server. With a Virtual Server, you will be able to add resources as needed in smaller increments instead of paying for processing, memory and storage that you do not use. Take your business to the clouds. The internet has changed the way people do nearly everything from entertainment, performing research, to creating and fostering business and personal relationships. The Net's effect on business has been huge. And today, for mission-critical data, "cloud computing" is introducing many time and cost savings benefits to the way business is done. Don't let the phrase "cloud computing" confuse you. It is just a short way of saying your data is online via the internet in a safe and secure, always accessible location. Whether you're considering to move your business operations to the "cloud" or just want to test a specific application you use everyday (Quickbooks or Microsoft Office for example), cloud integration offers you and your bottom-line significant benefits. * Access to the "cloud" is from ANY web browser from any PC, Mac or Smart-phone, regardless of where you are. All you need is a connection to the internet. Even better is a direct connection to MontanaSky for reasons we will discuss a bit later. * We actually can "clone" your entire existing computer to the cloud, if you wish, complete with it's operating system and file structure you are comfortable with, resulting in less training and more efficiency for you. When you need more memory, processor speed or hard disk space.... we do it immediately with a turn of a knob: instant upgrades in the clouds. * For data in the cloud, companies like MontanaSky provide offsite data redundancy that's stronger than the backups most business users have in place. If your hard drive crashes or if your computer vanishes, you don't need to worry that your data has disappeared forever. It has not! MontanaSky's cloud is duplicated in another secure location, too! * A wonderful added benefit is MontanaSky's experts work with your existing IT people so they can continue to provide your company with their trusted and beneficial expertise, or MontanaSky can provide with complete PC to Cloud support to help make your entire workstation, network and connection to all IT services secure, efficient and trouble free. With the right turnkey service plan with MontanaSky, you can have your computers and IT network running strong and your apps in the clouds, ready for you to take advantage of never having to buy, maintain or back-up an in house office server again! And your network will free of bottlenecks, slowdowns outages that you may have come to expect as normal. It does not have to be that way. MontanaSky is a ray of sunshine in the clouds! We can schedule a personal consultation with you today, so please call right away! Host your website with us. At MontanaSky we believe in personal service. We will register a domain name, and get you set up with FTP, Email, Database or whatever you need. We host WordPress and will help you install it if needed. Hosting Plans come with 5Gigs of storage and 20Gigs of Bandwidth. If your website exceeds this size or usage, we will contact you to make unique arrangements for your situation. 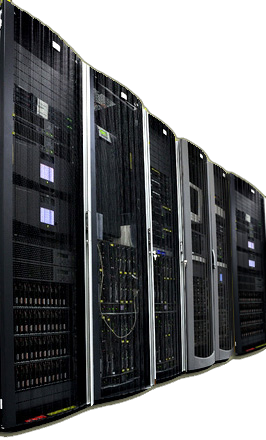 Our servers are scalable to handle any of your web needs. For Hosted Business Applications, such as hosted MS Exchange, and other software that is accessed remotely, we give custom quotes. *May vary depending on TLD cost. Most existing businesses already have a domain name. Some have no services attached to it and others have only email. Some have only a website, and others have everything, but scattered across many vendors and geographic locations. Setting up a website can be pretty straight forward, especially if you start from scratch. Not much can go wrong. Moving a website can be a bit trickier, as illustrated in the graphic above. Many separate parts. The "address" of each part must be known by its parent. It is entirely possible to have one company host the email, another host the website, and a third manage the domain name etc. It is usually easier to let one company take care of all of it. It reduces the chance of duplicate settings and routing conflicts. DNS (2) is one vital part that most people are unaware of. 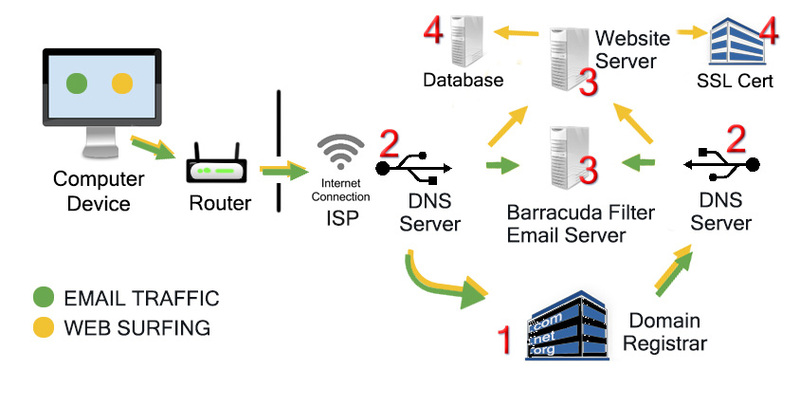 DNS is the address authority for routing all traffic for the domain name. Including Email (MX), Web traffic, sub domains, (A and CNAME records), SPF and TXT records for domain validation etc. Without a DNS server, your domain name would go nowhere. Many businesses find an eager web designer who points the domain name to their favorite reseller account without realizing that email will stop working. If Address records are left behind in the abandoned DNS Server when a Domain Registrar is no longer pointing to it (DNS), it (the previous DNS) will continue to direct random Internet users to the old site. This can cause strange behavior. The same goes for website, email and DNS. There is no such thing as moving or transferring. There is only Add and/or Delete. Don't forget to Delete! or notify your old host when you move. The ONLY thing that you TRANSFER is a domain name. It can only exist in one place (registrar 1). Consult with your hosting company regarding potential pitfalls before moving your website. MontanaSky can provide all the services in the illustration, including the Internet Service throughout most areas of the Flathead Valley of Montana.